Hi friends!! 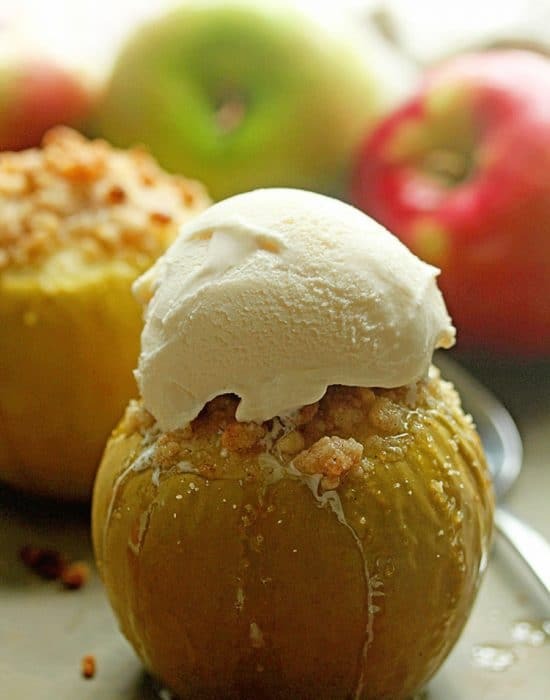 I am bringing you an exciting new recipe today…or what I think is exciting. These honey lavender marshmallows were a creation in my kitchen on accident as I was testing a recipe for espresso marshmallows. See to make marshmallows you start cooking sugar, corn syrup and water to 240 degrees (or there about) before whipping that up until stiff peaks form. I didn’t have corn syrup and it was 10pm at night, I was not about to go out to get it. But I was also not about to stop the process. So I researched substitutes and it turns out you can use honey. Several websites suggested using honey but I was not feeling it with the chocolate + espresso I had in mind. 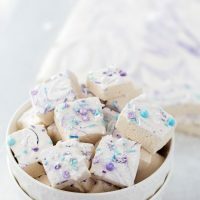 And a light bulb went off…just make honey lavender marshmallows as we all know honey + lavender is a proven flavor combo (hello honey lavender macarons!!). And the rest was history!! After two tries, I got the ratio of sugar to honey down and I was happy with the recipe. Like all homemade marshmallow recipes, they are perfectly imperfect in the way they look but taste amazing! The sweet dark flavor of honey and hints of fresh lavender sips through each bite. I enjoyed this mostly just by itself but once in a while I would drop it in white hot chocolate and it was incredible. I did top half of the marshmallows (pictured) with sprinkles and the other half with purple coloring swirls purely for presentation. 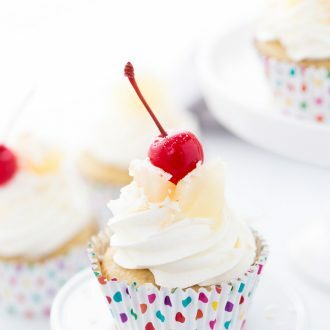 I love those sprinkles and thought it was appropriate for Spring flavors in this recipe. 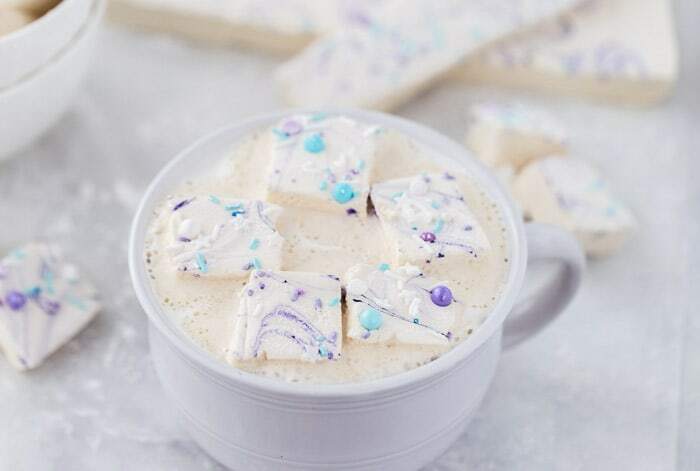 If you are looking for a unique marshmallow recipe to try, these are the ones. They will be great as homemade gifts and hostess presents! Grease a 9 x 13-inch baking pan with cooking spray. Line with parchment and grease parchment. In a large bowl, add ¾ cup water. Sprinkle the gelatin on water and let sit for a few minutes to soften. In a medium saucepan, combine the rest of the water, sugar, honey and lavender sprigs. Bring to boil over high heat. Once boiling, use a candy thermometer and cook until the mixture reaches 240 degrees. Remove it from heat and remove the lavender sprigs. Using a mixer on low speed and using the whisk attachment, mix the gelatin mixture. With the mixer on, pour the hot sugar mixture into the gelatin mixture. Pour down the side of the bowl to avoid splashes. Gradually increase the speed of the mixer to high and beat the mixture until stiff peaks form, about 10-12 minutes. Add in vanilla extract. Mix for additional minute. The mixture should be cool. Pour the mixture into the prepared pan using a silicone spatula. Smooth the top with an offset spatula. Add a few drops of violet food coloring and using a butter knife, swirl the coloring on top. Let cool and firm up at room temperature, uncovered, for at least three hours or better yet overnight. When ready to cut up, sift the confectioner’s sugar onto a working space. Turn over the marshmallow onto the sugar. 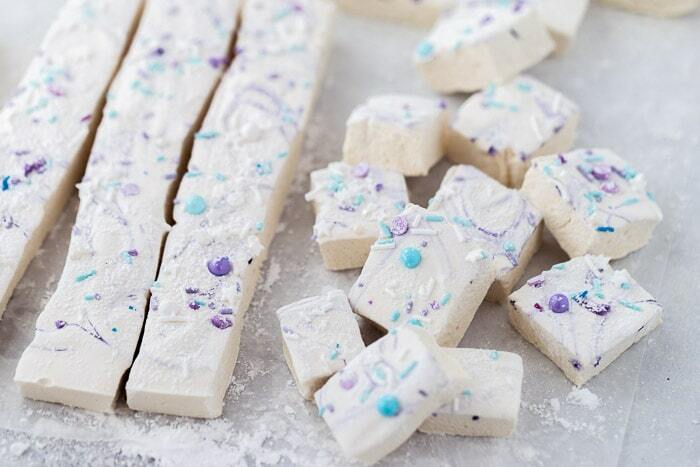 Using a greased sharp knife, cut the marshmallows into squares. 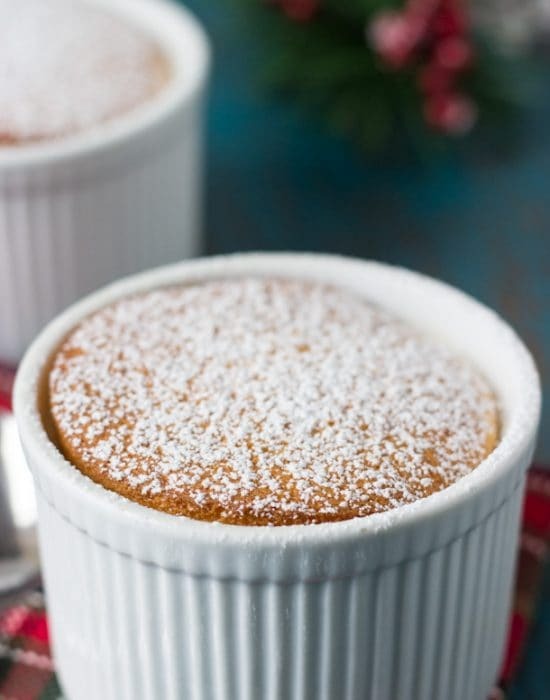 Roll in powdered sugar and serve with hot cocoa. Store left overs in an airtight container for up to a week. Yeah the honey would not have worked with the espresso combo I had in mind. Hope you try them soon! Isn’t it nice when accidents turn into something great! Obviously I’d absolutely chocolate and espresso, but this flavor sounds so perfect for spring! They’re so pretty, and I’ll bet the honey really makes these special. It’s a great feeling!!! Thanks Marcie! I absolutely love when accidents turn into a happy ending! 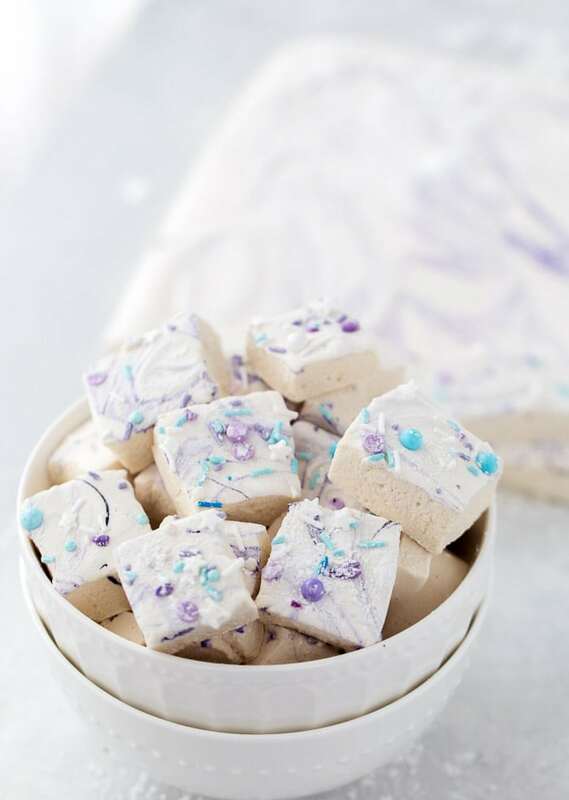 I’m so glad you didn’t have any corn syrup, because these honey-lavender marshmallows are gorgeous! Plus I’m allergic to cocoa, so I couldn’t have eaten your original idea anyways. 🙂 Hehe. 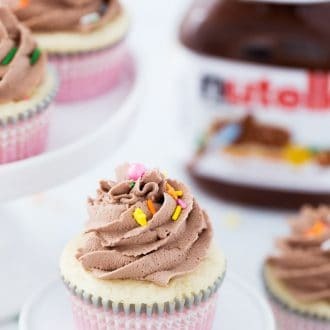 Seriously, Zainab, I am just drooling over these! They are perfect for spring, and would be EXCELLENT for Easter!! Pinned! Cheers! Hhaha..I remember you are not a chocolate fan lol! But glad these would work for you! Yay for happy accidents! I love the honey in here so much better than corn syrup. 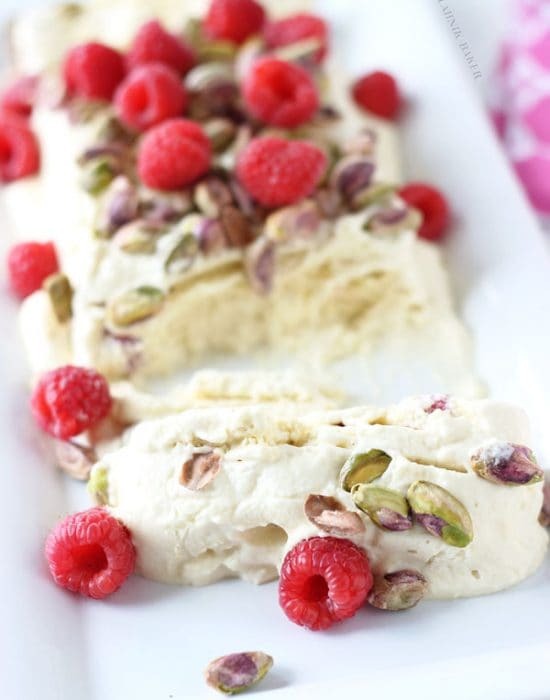 These are the prettiest marshmallows and so perfect for spring! 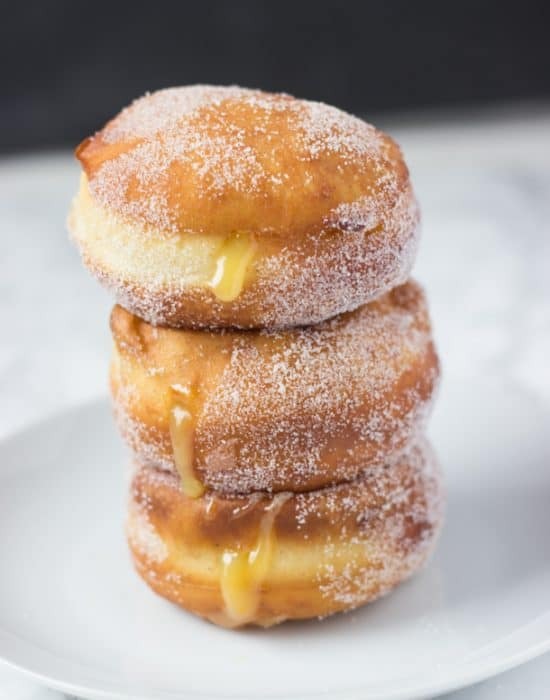 These look like a beautiful, delicious accident! I love learning new methods when it’s too cold (or I’m too lazy) to pick up a missing ingredient! It was a delicious accident!! And same here…my lazy encounters sometimes lead to good ideas. I love happy accidents in the kitchen! These honey lavender marshmallows are so beautiful – I bet the lavender flavors is so beautiful in there. Love your pretty swirls too! I love happy accidents!! Thanks Rachel! ooh, how exciting!! what did you plop them into? a cup of white hot chocolate?! (which sounds delicious but i’m also certain that whatever you had would be tasty no matter what since there’s marshmallows :3). Yes, it is white hot chocolate! My favorite!! I am not a fan of storebought marshmallows but I LOVEEE homemade ones! This flavor combo sounds amazing! I need to try using honey next time I make a batch! Same here Ashley! The homemade ones are 100X much better. Um, can you say GENIUS! I probably would have thrown in the towel and/or screamed at the.boy to run out and find corn syrup but I love how you persevered. Plus, I feel way better about eating marshmallows made of honey than I do corn syrup so this is a win/win! Hhaha well sadly for me the hubs does not go out for trivial things (by his definition of course) since his reason is that I am always out of something. Pffft…not true! !